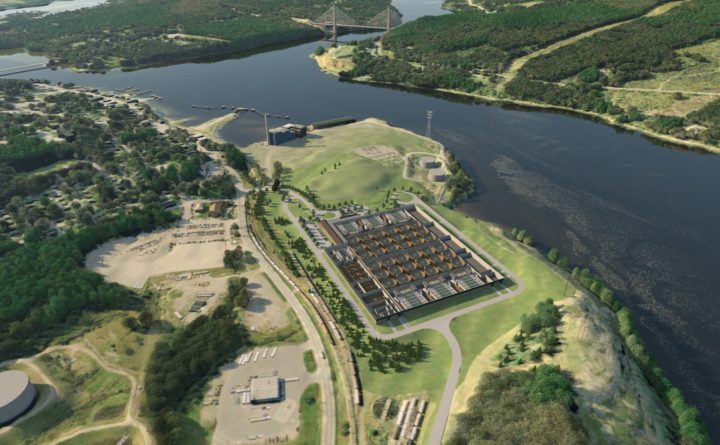 Computer renderings of Whole Oceans' indoor salmon farm, slated for construction at the former Verso paper mill site in Bucksport. A Belfast woman lives too far from a proposed $250 million indoor salmon farm in Bucksport to appeal a wastewater discharge permit state regulators have issued. That’s the argument Whole Oceans LLC is making in a motion filed with the state Board of Environmental Protection earlier this week to dismiss Holly Faubel’s appeal of the wastewater permit the Maine Department of Environmental Protection granted the company in November. Whole Oceans hopes to start building the aquafarm this spring at the former Verso Paper mill site. Faubel’s appeal, filed Dec. 17, continues a pattern of the loudest objections to the Bucksport plant coming from a city more than a dozen miles away where another salmon farm is proposed. “Thus, Ms. Faubel is clearly not entitled to the liberal view of particularized injury afforded [in previous board decisions and case law] to those who are abutters or neighbors and she must instead show how she is ‘unique’ from everyone else who uses the waters of the Penobscot River, Belfast Bay, and the rest of the Gulf of Maine,” attorneys for Whole Oceans wrote in the filing. Reached Friday, Faubel declined to comment on Whole Oceans’ response, saying that she was writing her own response this weekend and would speak after she finished. Whole Oceans President Jason Mitchell said the company would continue to support the appeals process. Maine DEP granted the permit Nov. 21, the last hurdle to the Portland-based company closing on a deal to buy a portion of the defunct mill site and employ 50 people in the project’s first, $75 million phase. Faubel wrote in her appeal that she owns 250 feet of shorefront in Belfast, and that she and her family swim in the Penobscot River area near the site and eat mussels, scallops, seaweeds and other products that come from those waters. Faubel has until the close of business on Monday to answer Whole Oceans’ response to her appeal, said Cynthia Bertocci, an executive analyst with the Board of Environmental Protection. After that, the board’s chairman has 10 days to rule on whether to accept the appeal. Whole Oceans then would have 30 days to comment on the substance of the appeal, and the board would rule on the appeal at one of its following meetings, Bertocci said. The board meets the first and third Thursdays of the month.